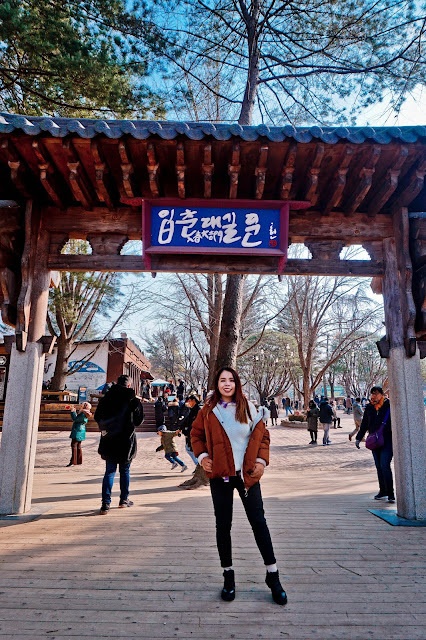 Finally, time to blog about my Korea Day 1 journey. 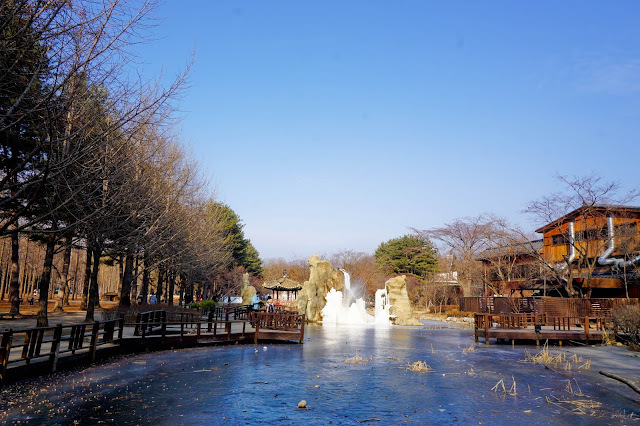 This time we decided to follow a tour to Korea as we plan for Skiing too. 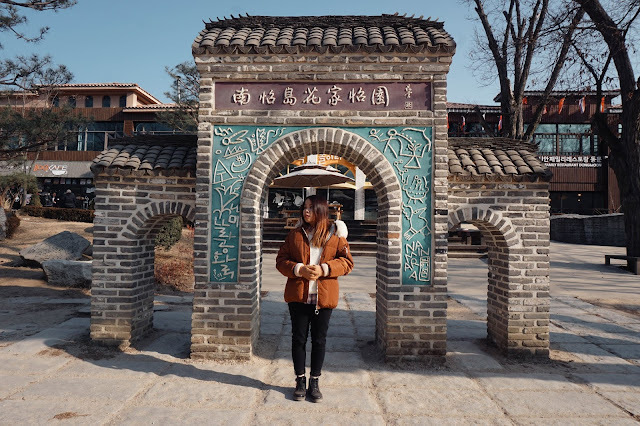 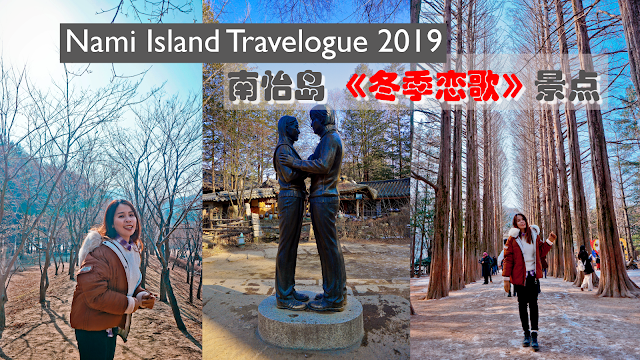 Basically, the tour just "baogaliao" and we don't have to plan for any itinerary. Therefore this entire trip is pretty tiring but also a fun and meaningful trip together. 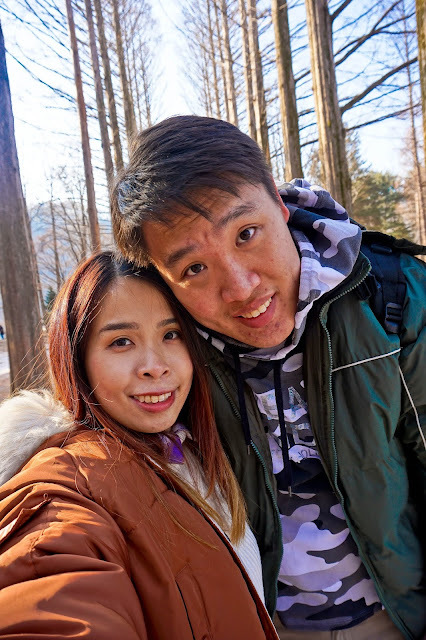 Also, Is been a while since we both went for a trip as a couple. 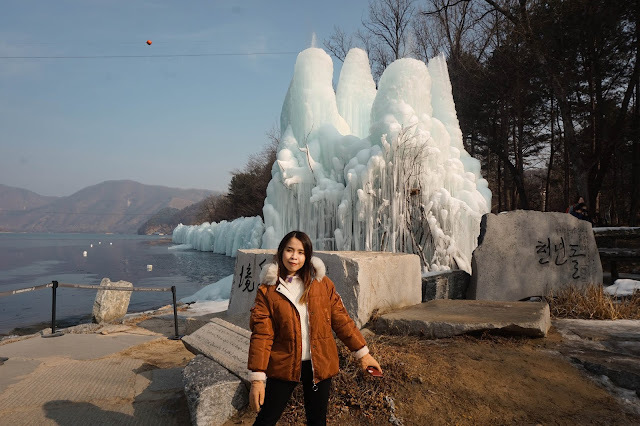 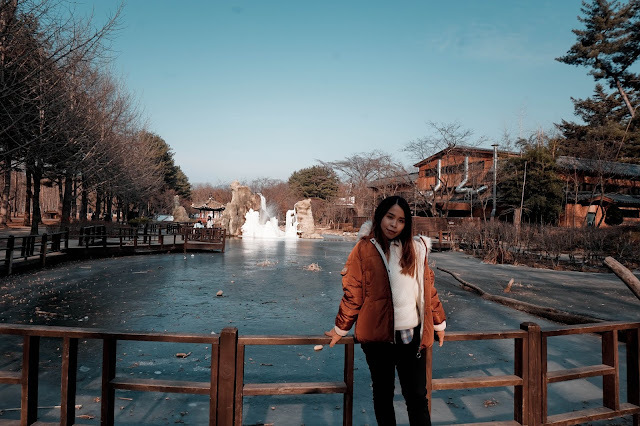 We visited Korea on 11th January to 15th January, during that time is winter period it can reach -3 to 0 at night to 1 to 6 degrees in the day time. 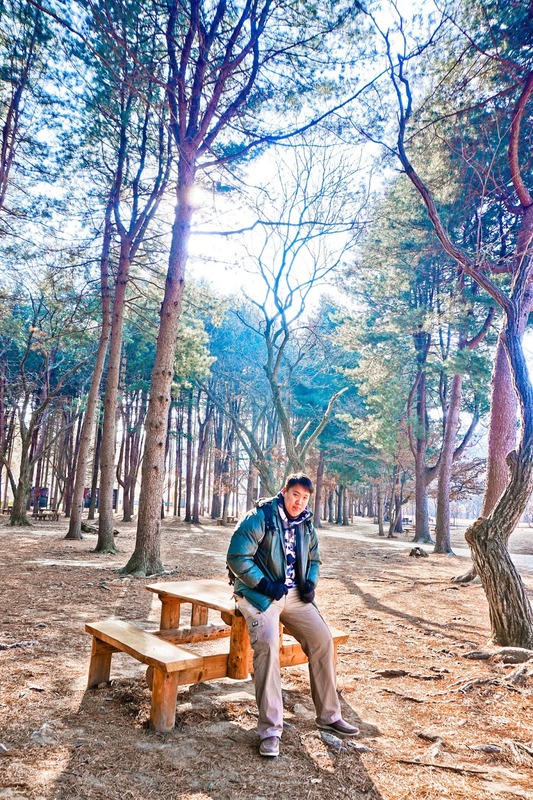 But I would say not only is it winter weather, but also the cold breezing wind at Korea too. Therefore it is best to pack up all your winter outfit, add on the face mask to prevent cold breezing wind on your face. 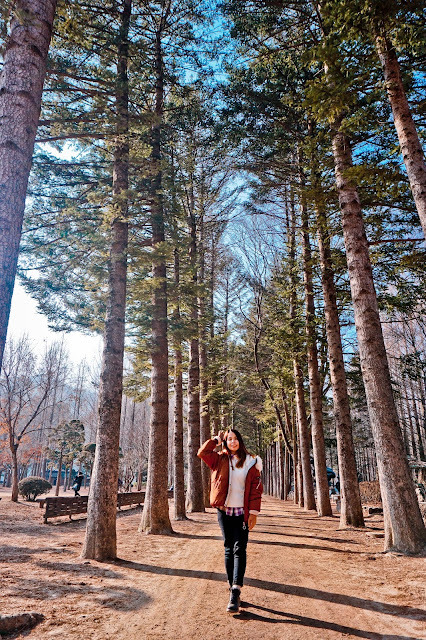 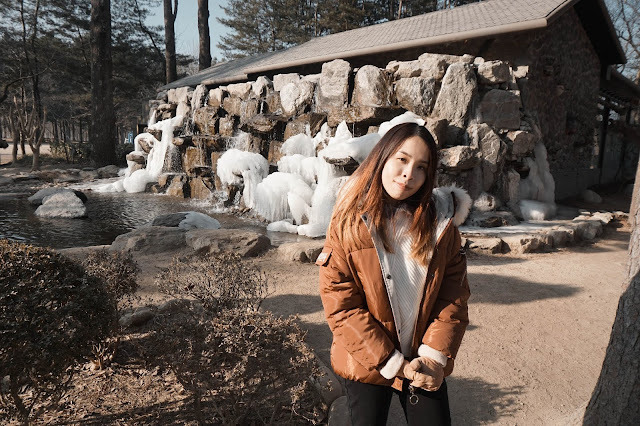 For our day 1 at Korea, we visited Nami Island. 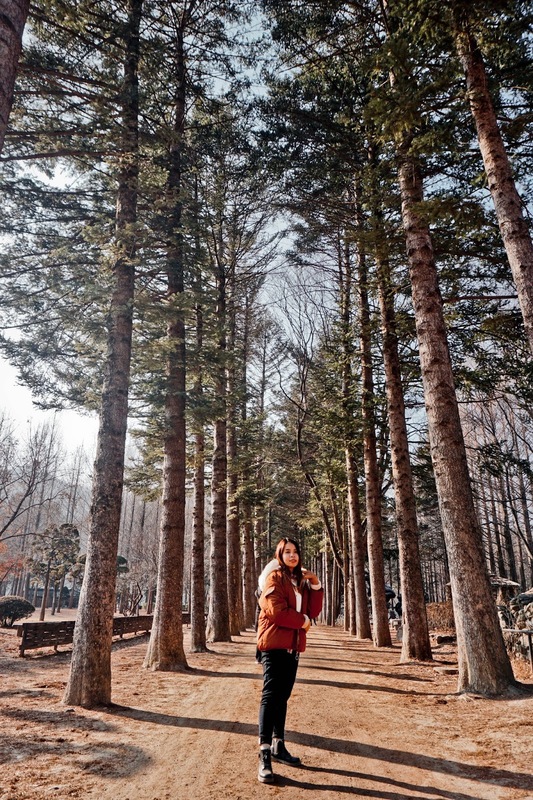 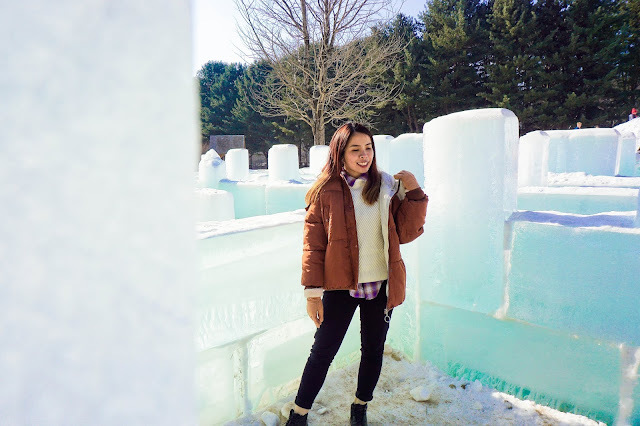 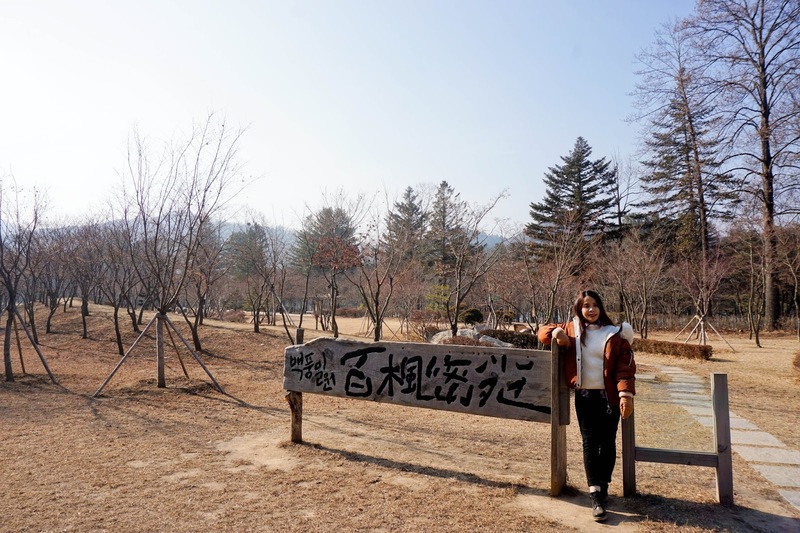 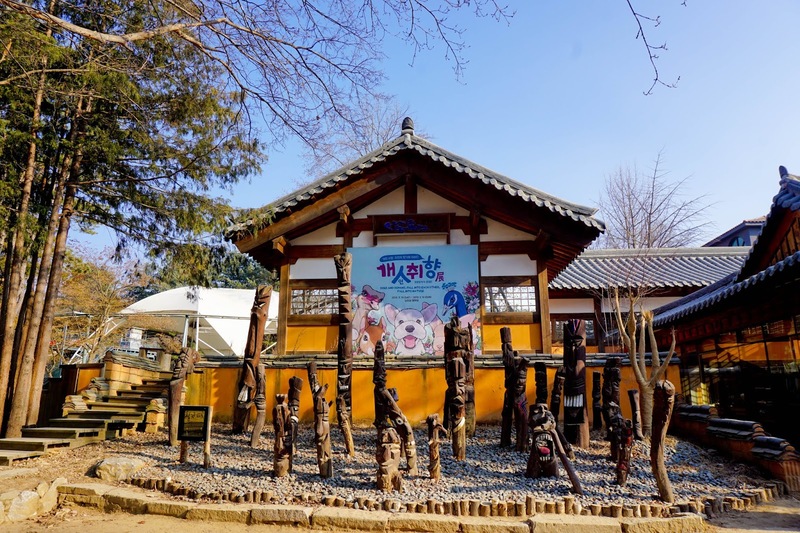 For this entire post, I will share all the photos I take at Nami Island. 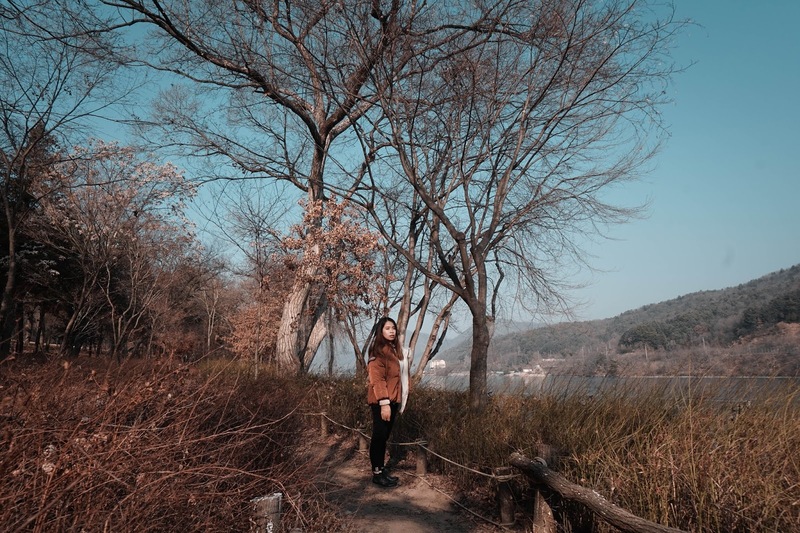 I won't be writing a lot in this post but will share a lot of photos. 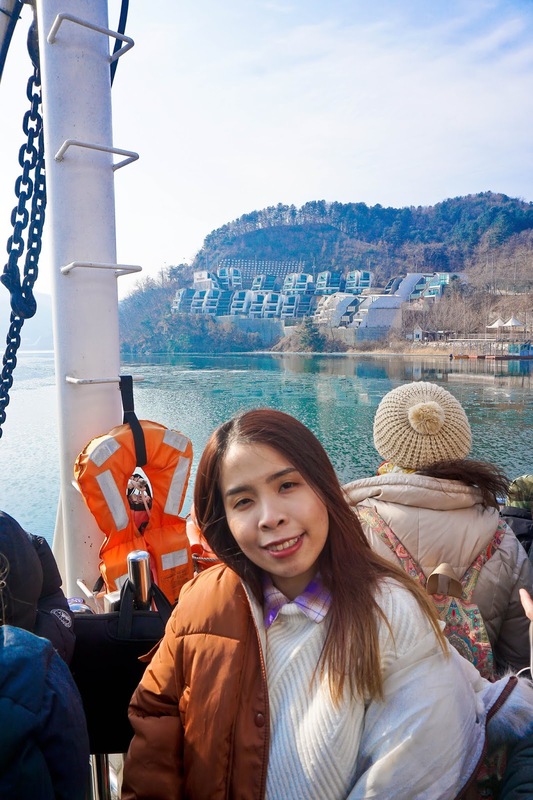 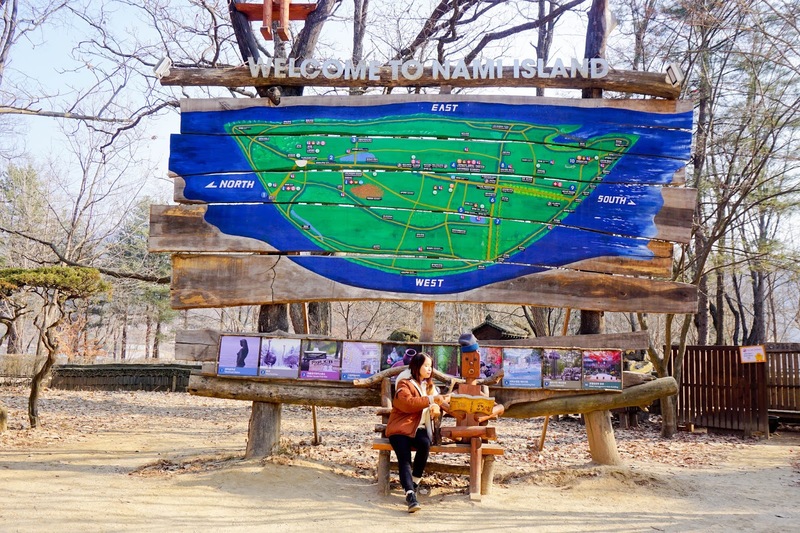 It is required to take a 5 minutes boat to Nami Island. 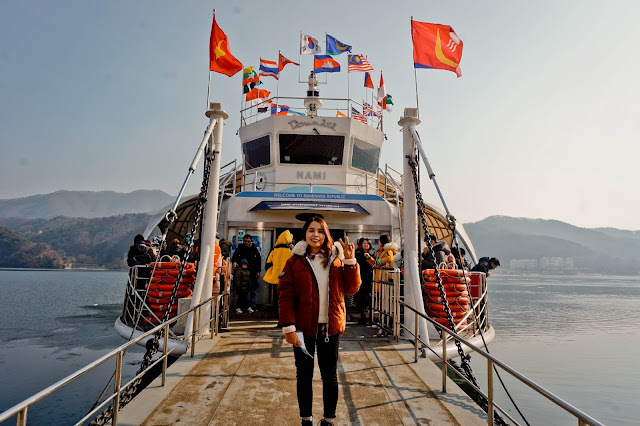 Check out the link here to know about ship operation time and ticket info. 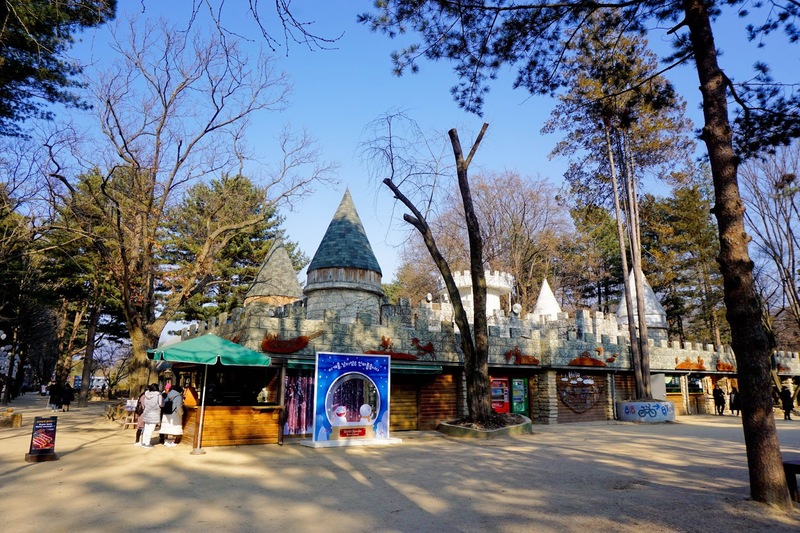 The first thing we saw when we first reach Nami Island. Time to explore Nami Island. I can't believe that here in Nami Island there are still left dry Maple trees for me to take some nice photos too. I have never been to the autumn season before, and able to see the maple leaf by my own eyes is really exciting! 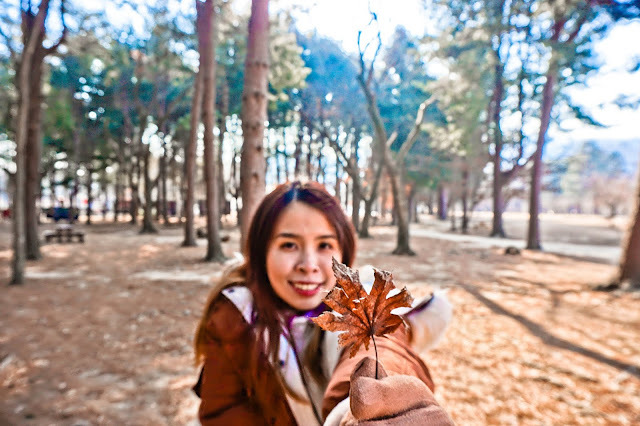 Although is just left remaining dry leaves, but I still having fun taking photos with the tree. Doesn't feel like is winter. 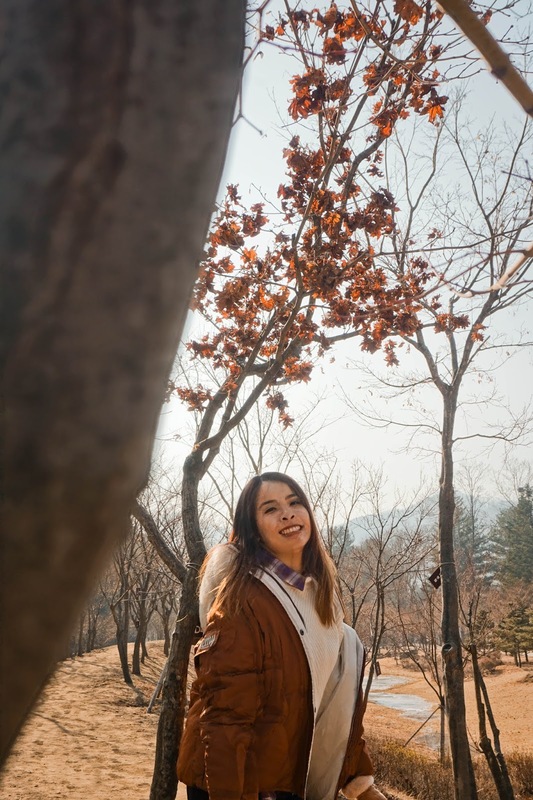 Still autumn here, haha! 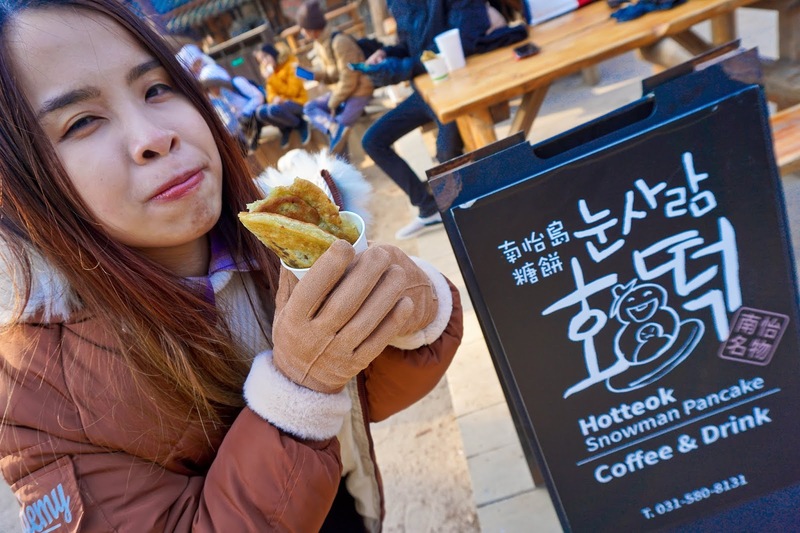 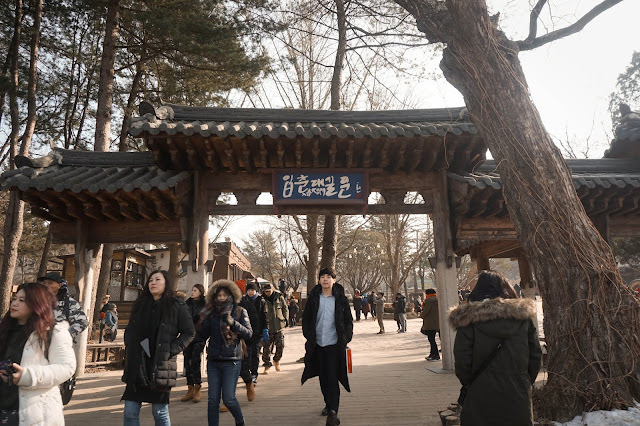 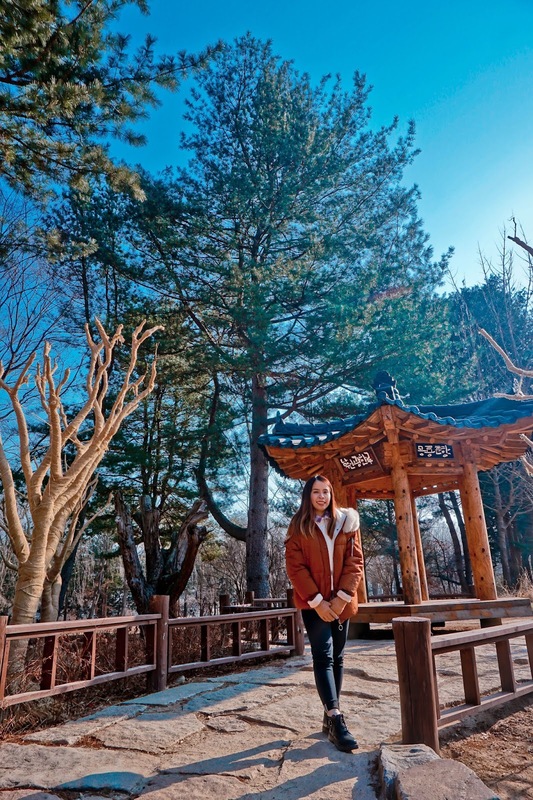 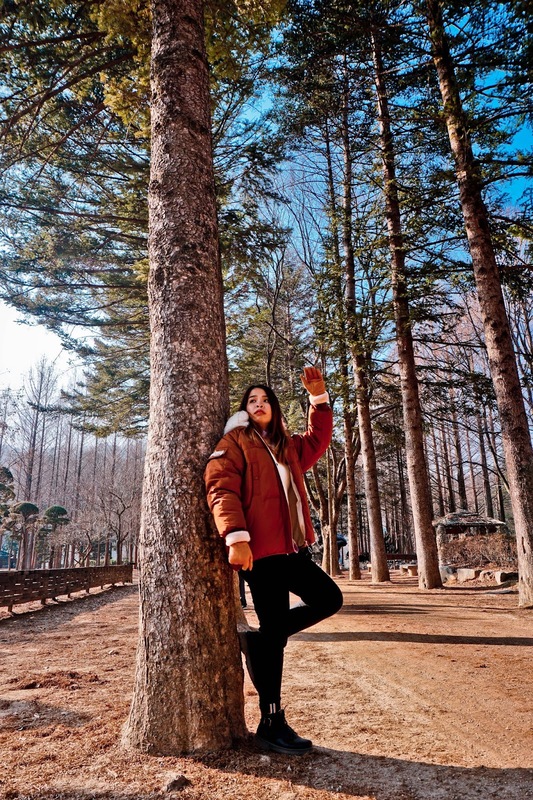 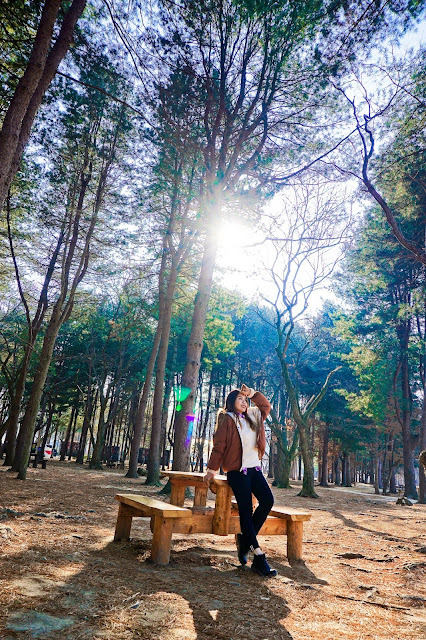 But is really cold as well, because since Nami Island is an island, there is also cold windy breeze here. 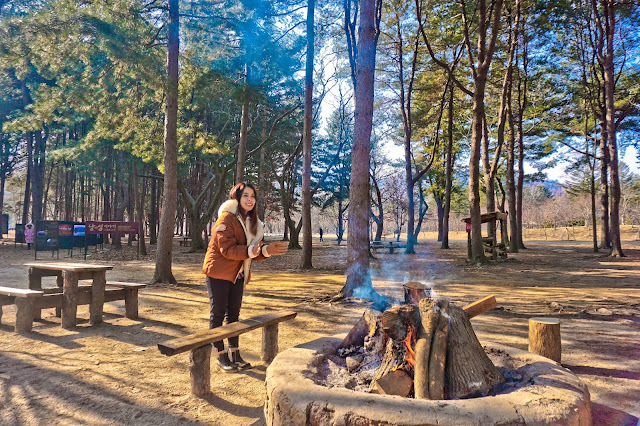 You can enjoy some warmth beside all their outdoor stove with wood logs. 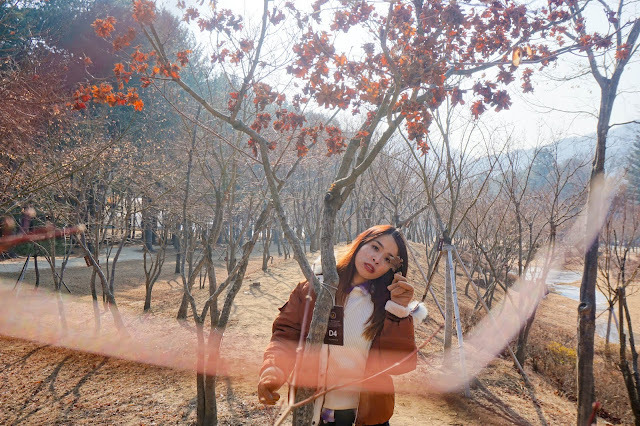 Take off my outerwear to take some nice throwing leaves photo! 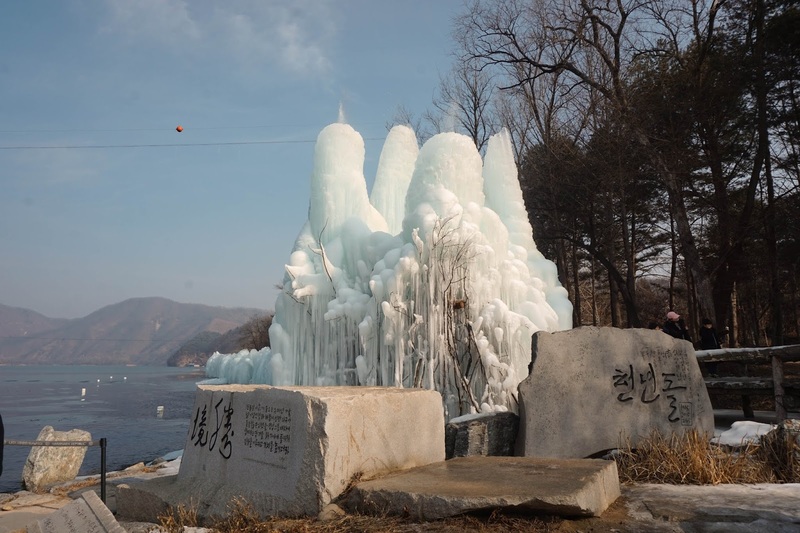 The next thing we know there are some fun ice activities in the middle of the island. There are ice slides for kids and adults to play. 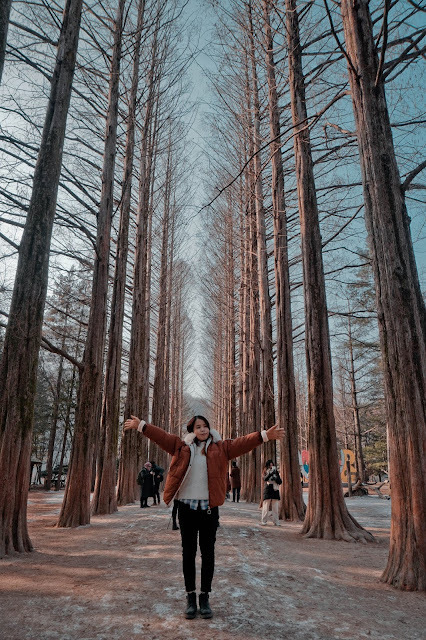 You can check my Insta Stories to see how much fun we have there. 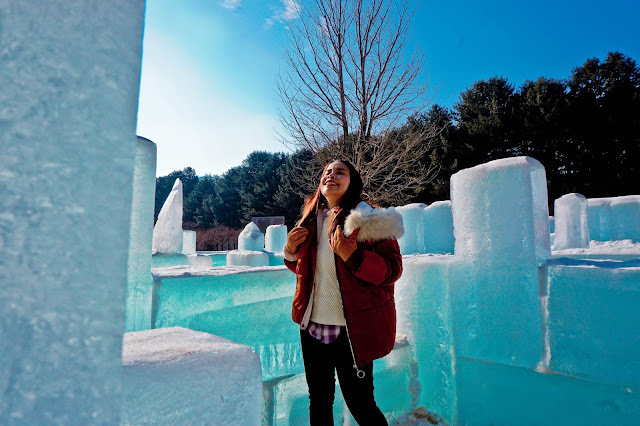 There are some nice spots for you to take some photos while there are remaining ices on the floor. 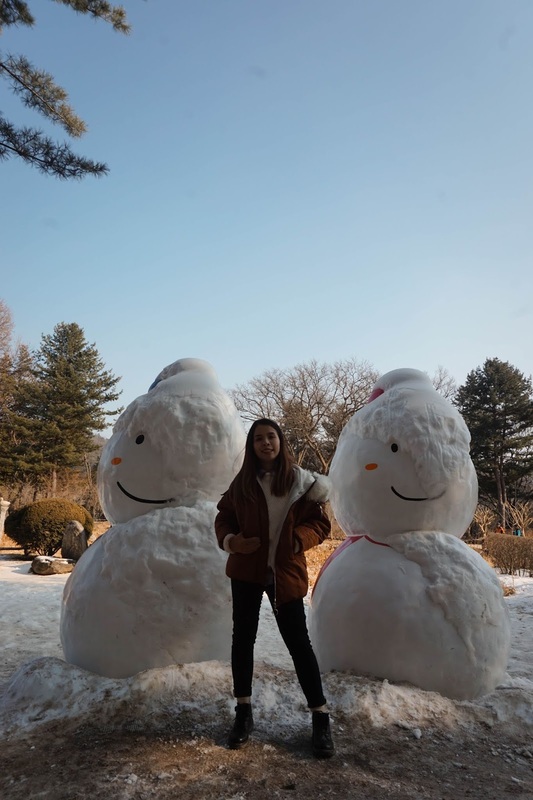 Although I doubt is from real snow. 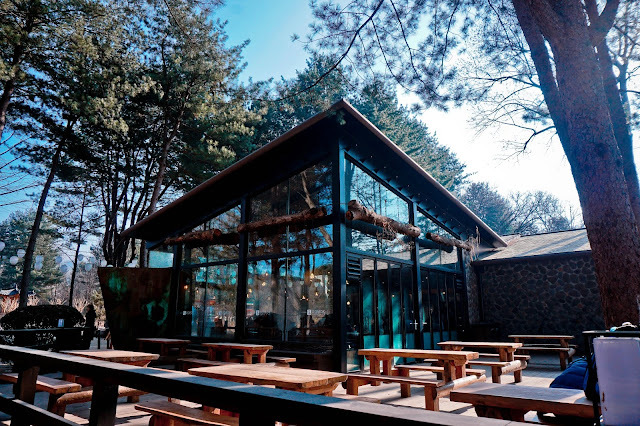 A really nice, chilling cafe! While we were given 3 hours time to explore whole Nami Island, is it so much bigger than I expected! 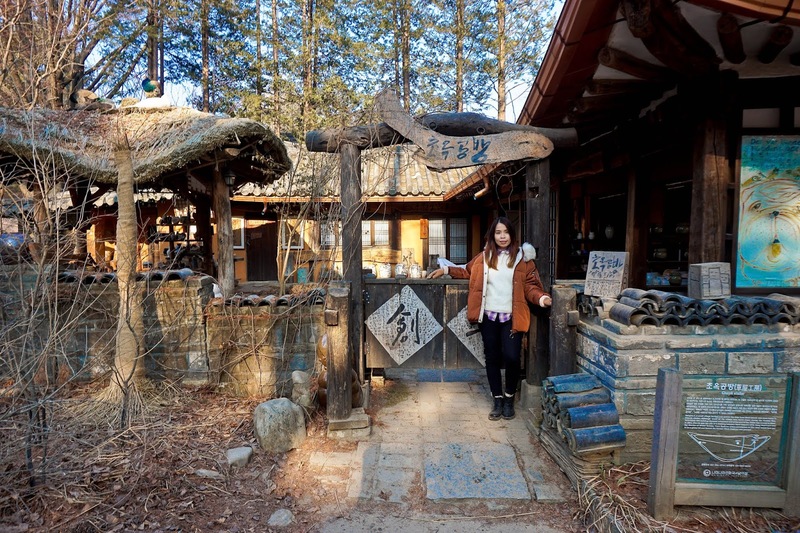 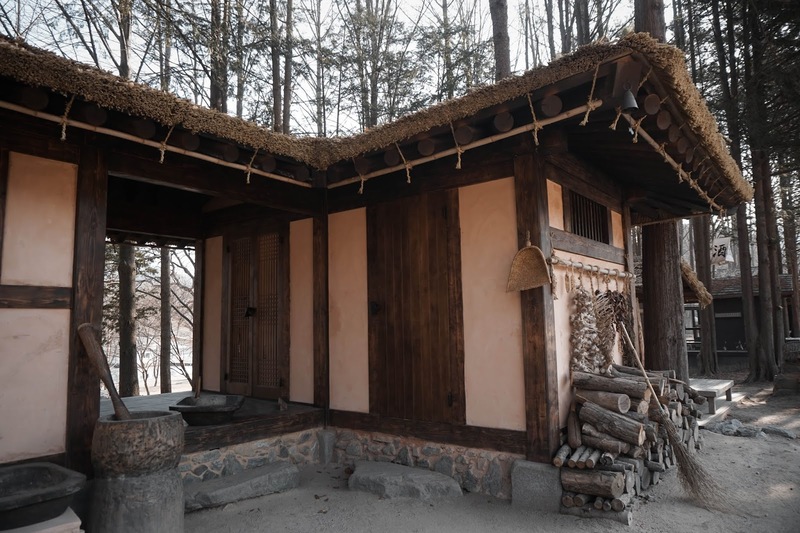 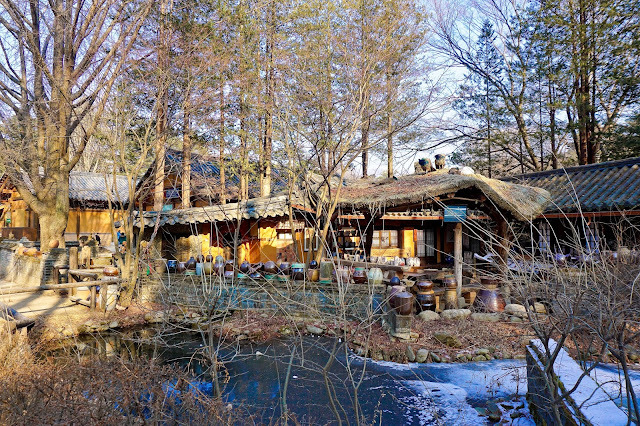 We found this really quiet but old Korea village houses at Nami Island too. I used to see this in Korea Drama, but now I can see it with my own eyes! There is also another side of the river when we further explore, where the river surface still freezing. 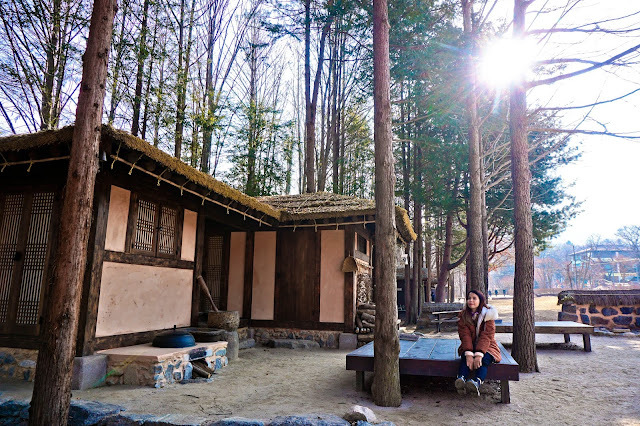 I really love this corner too, super artistic and peaceful vibes. 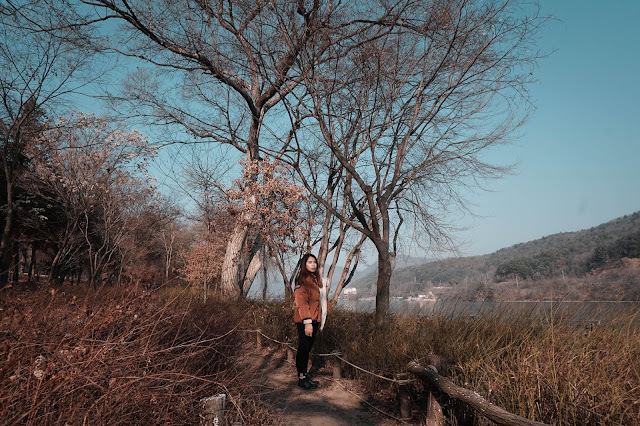 The view of the river and the trees are super pretty! 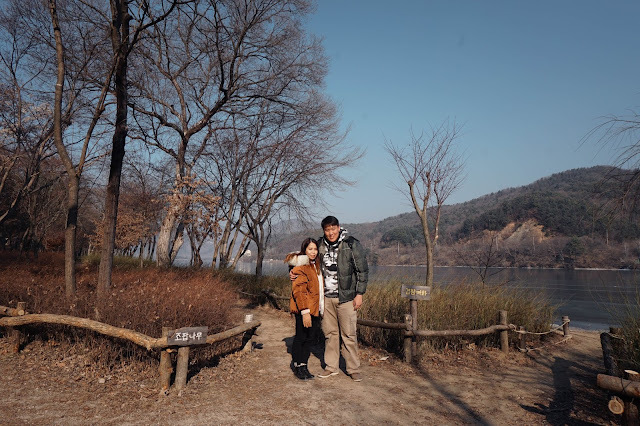 Thanks to those who help us to take a photo. While we continue to further explore, we are finally here at the Winter Sonata scene!! 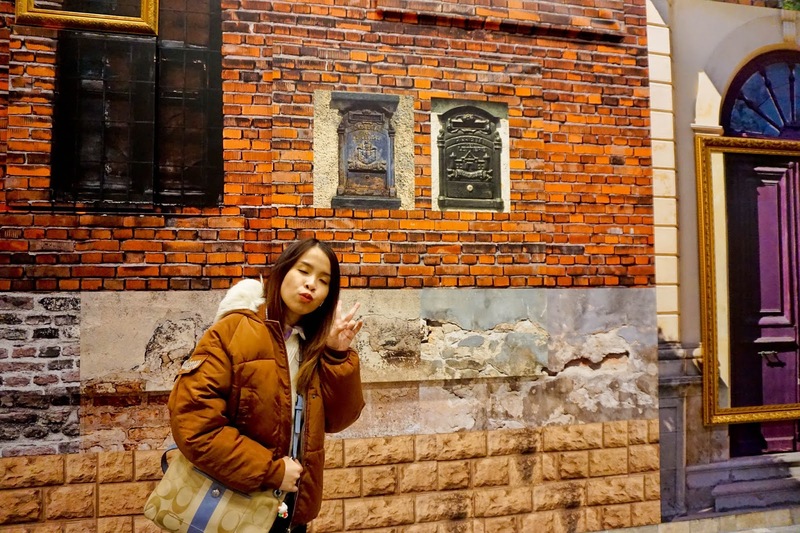 Still not the correct corner. 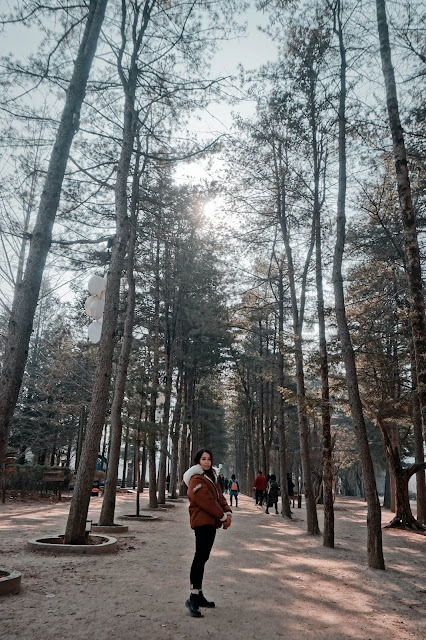 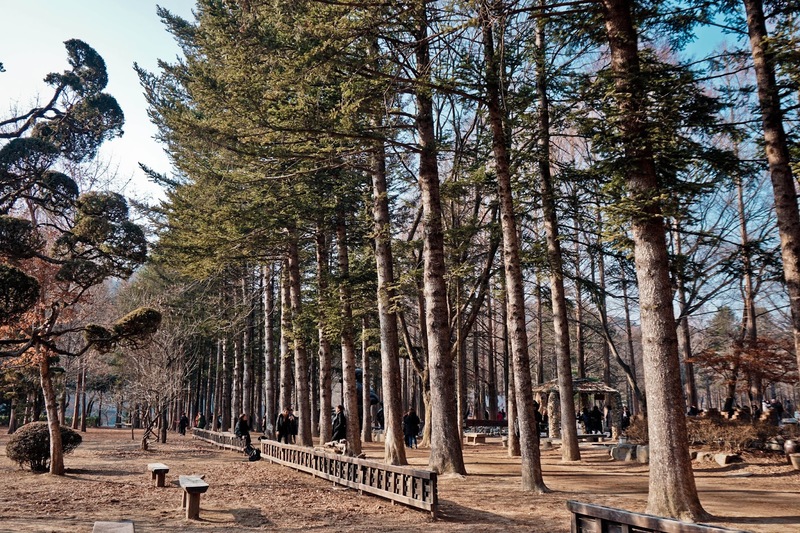 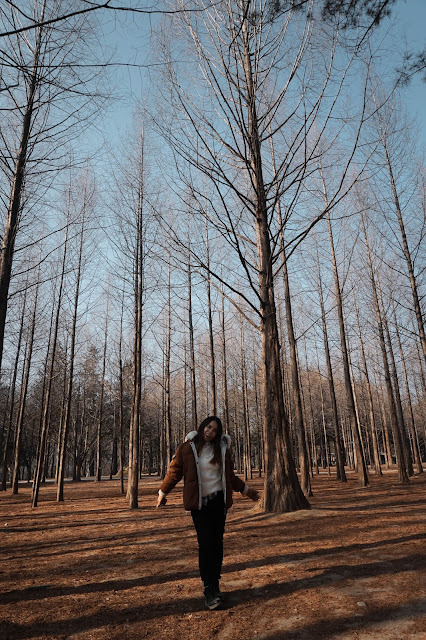 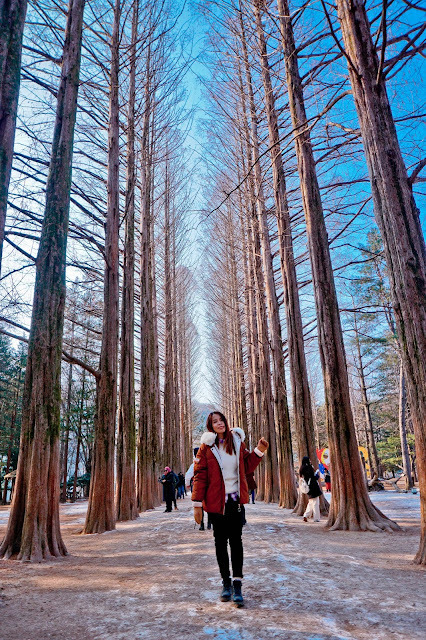 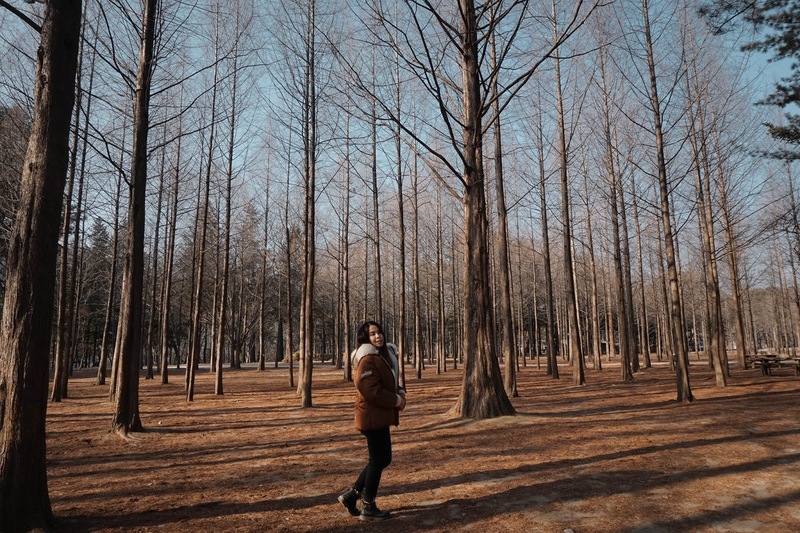 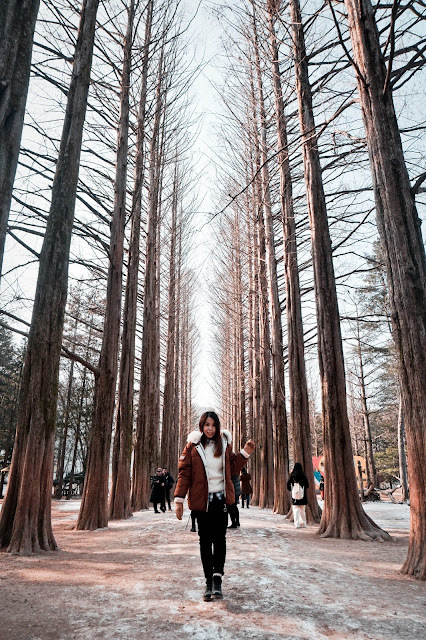 When you are here in Nami Island, there are so many similar tree arrangement like in Winter Sonata. 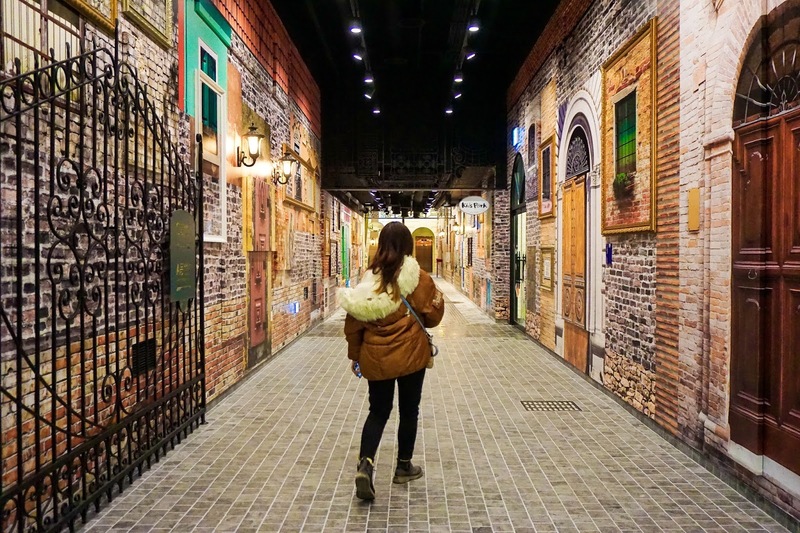 Read on to check where's the exact spot taken. There are so many people pose and take photos like this. Must also learn from them! 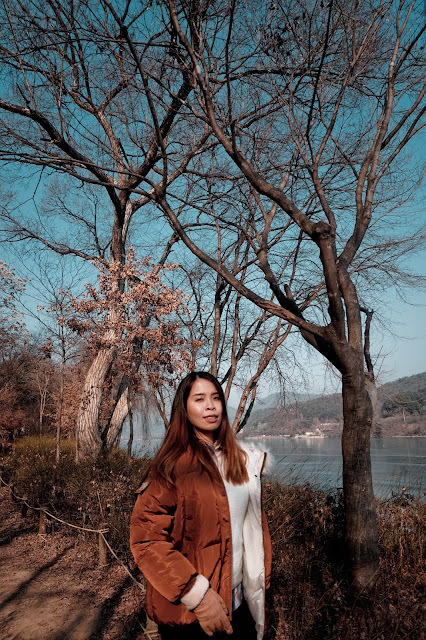 I love love all the sceneries here at Nami Island. 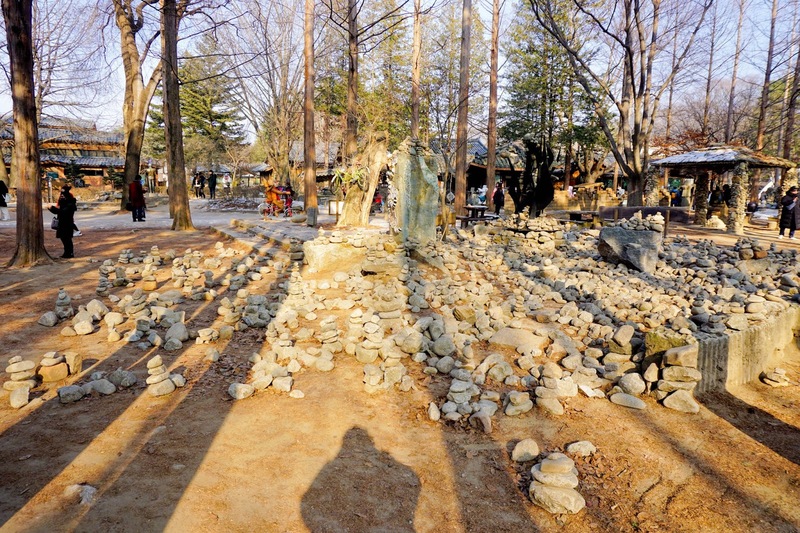 In Korea, you can see there's a lot of stacking stone around you too. 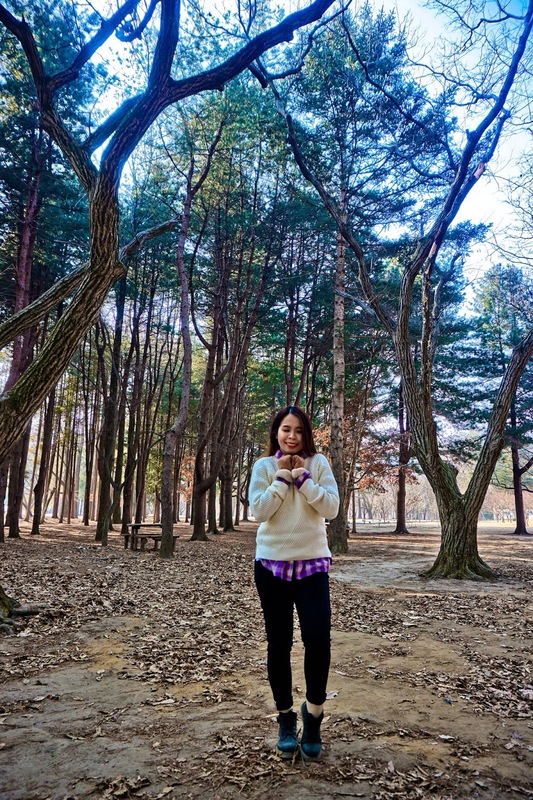 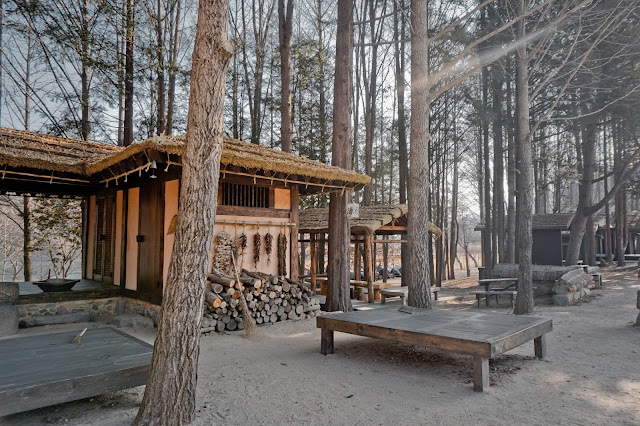 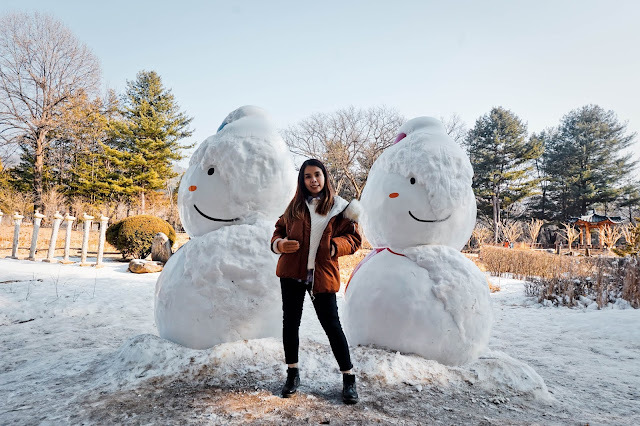 Not only in Nami Island but in the park area too. Its something like wishing stone wishes. Ta-da! 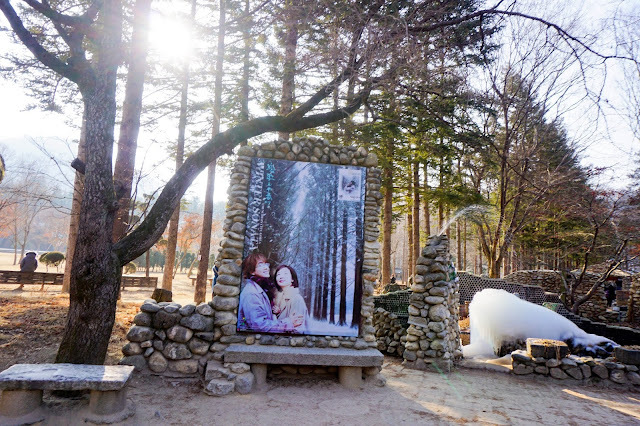 Finally, we are at the exact scene of Winter Sonata. The snow has been melted, but the remaining one still creates a really dreamy vibe. 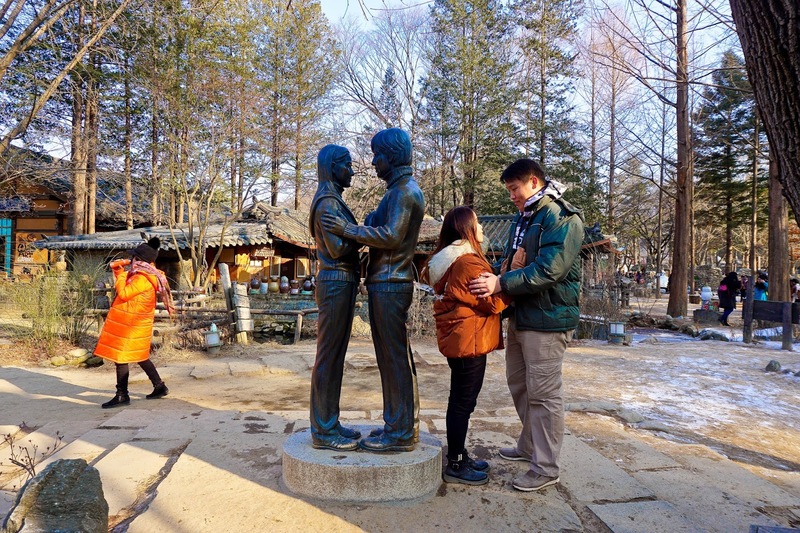 Due to there are big crowds here in Nami Island, Is really hard to take a good photo here! 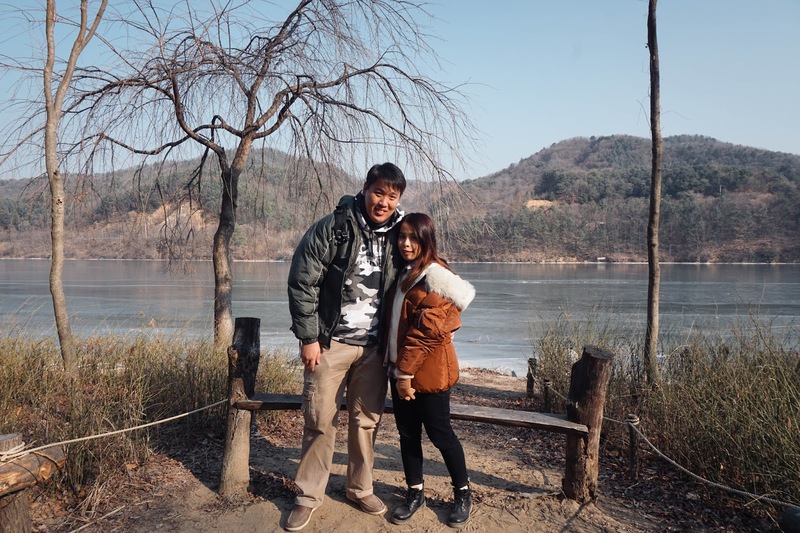 The river surface here is freezing!! 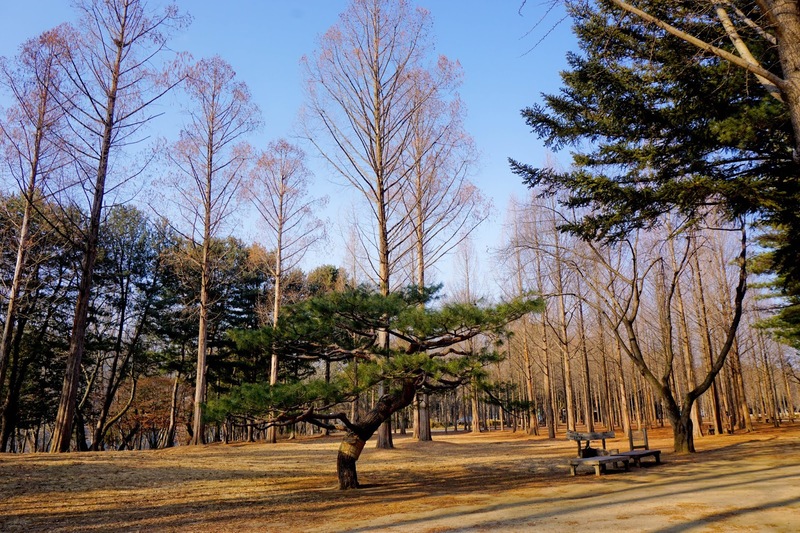 Although the trees are now bald without the leaves, still is it really beautiful too! We really had some hard time to look for this statue too. Who agree with me!? haha Not forget to take a photo with it too. 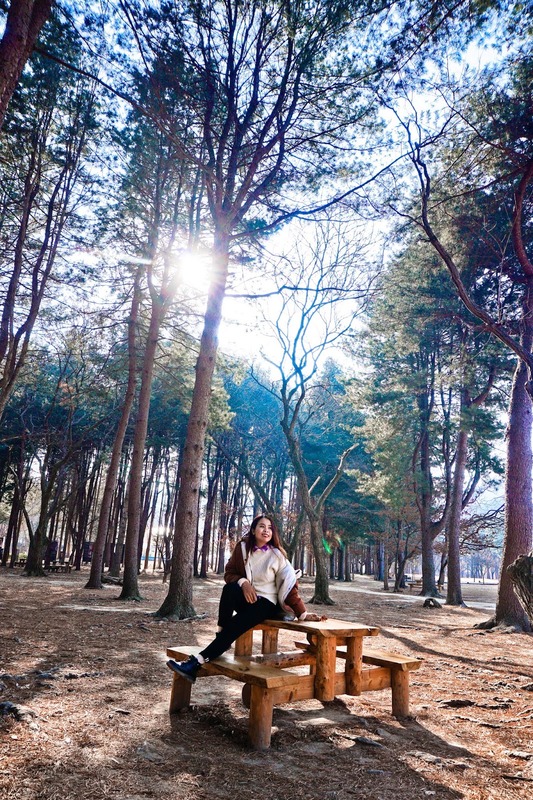 I just freaking love every corner of Nami Island. 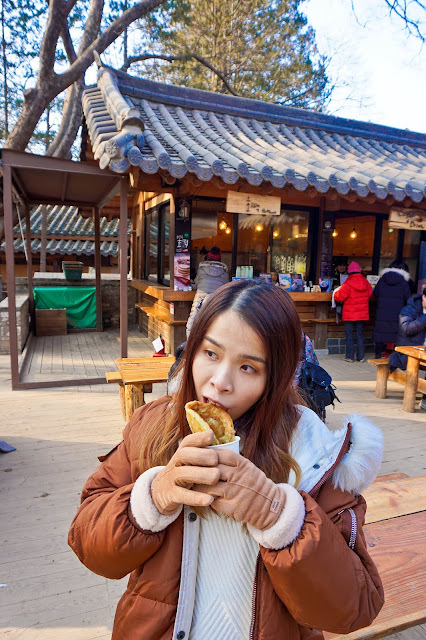 We grab some snack and head back to Nami Wharf where we need to gather. 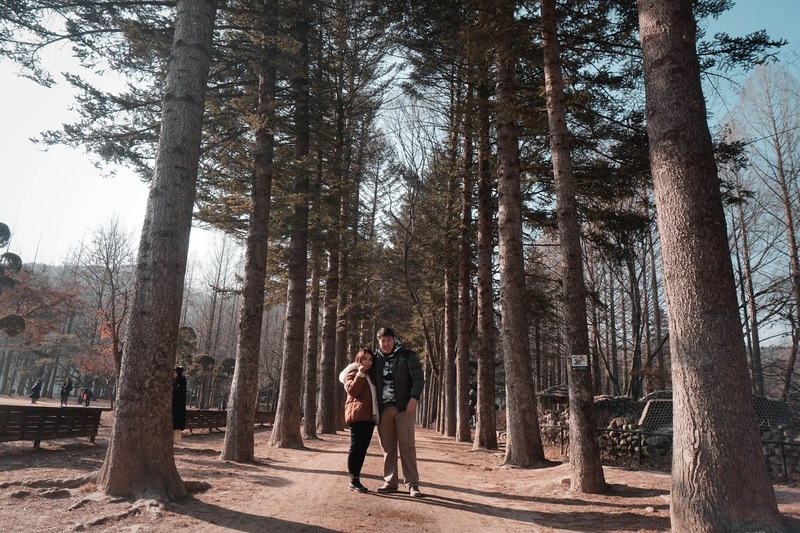 One last photo before head back! 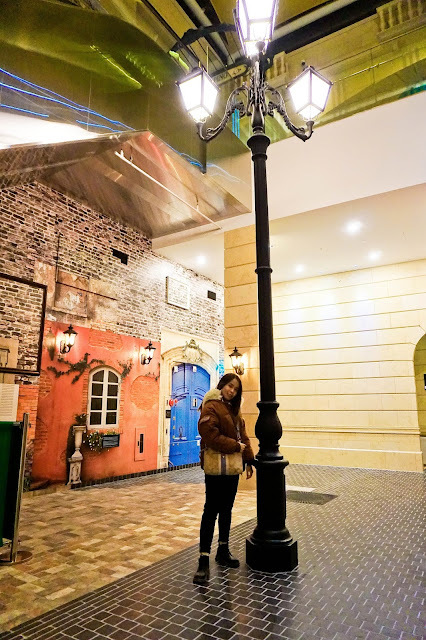 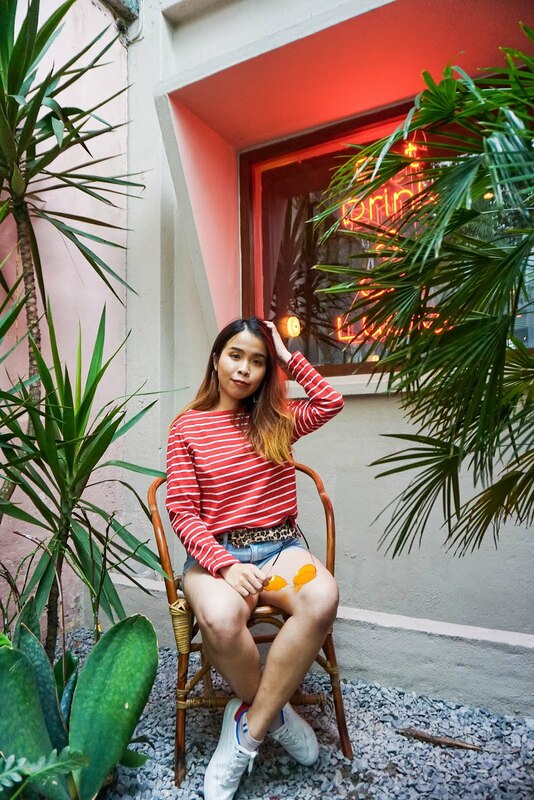 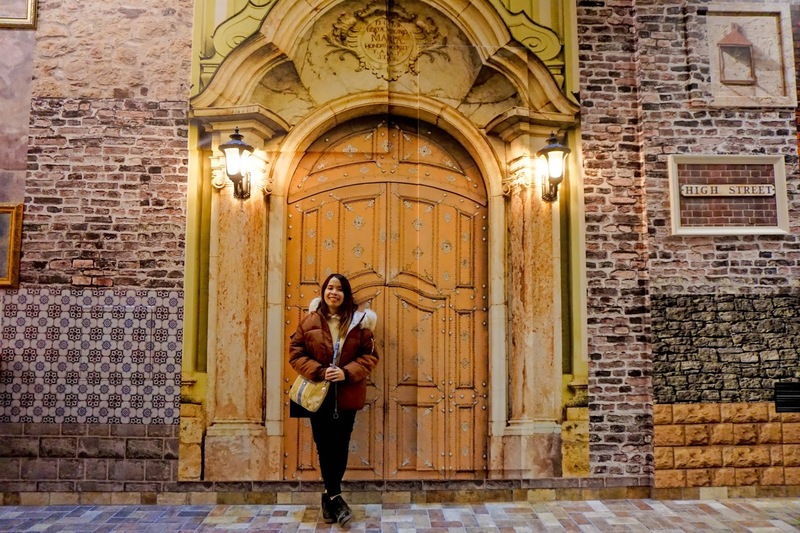 The underground area at our hotel is super photo worthy where there are also many corners for us to take a nice photo. Can't believe that we continue to explore our resorts underground even though we are super exhausted. 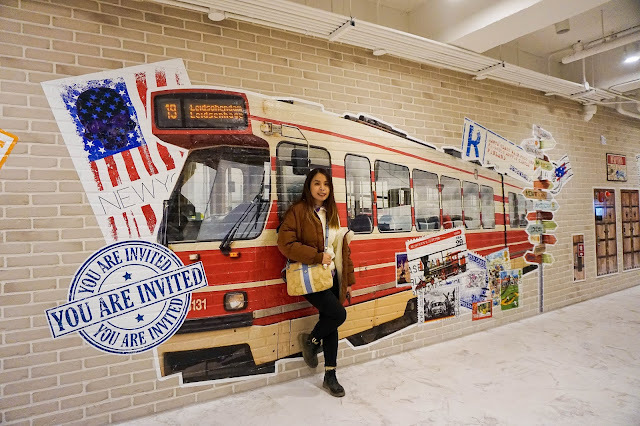 Midnight flight and reach early morning at Incheon, sleeping in airplane definitely not the best experience. 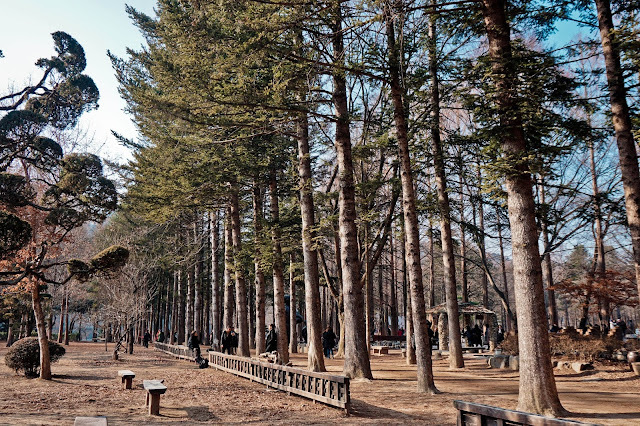 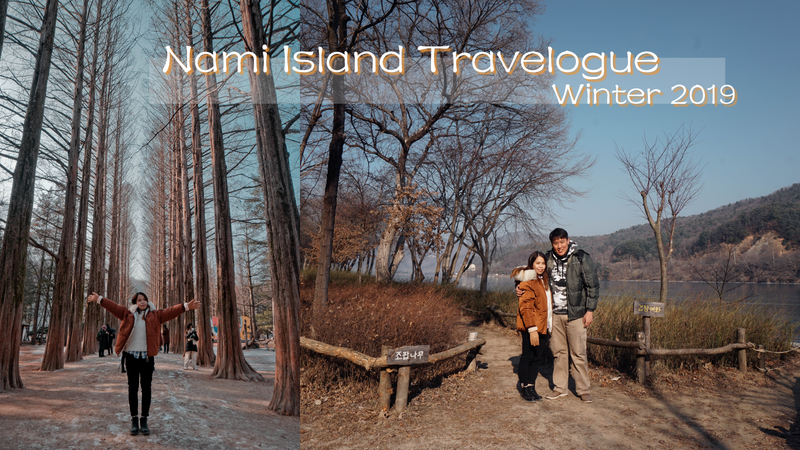 Thanks for finish reading my short Nami Island Travelogue! 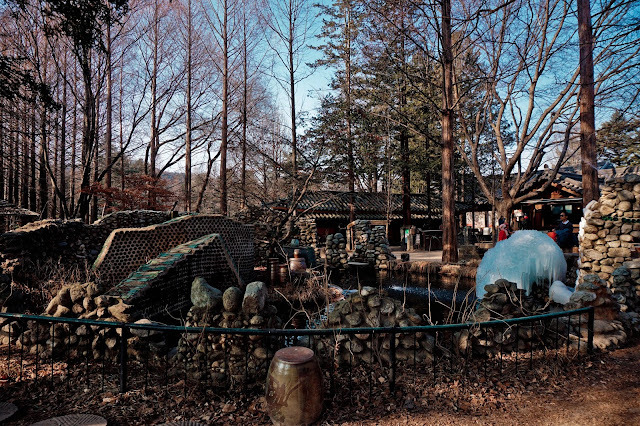 Time to head back to sleep. 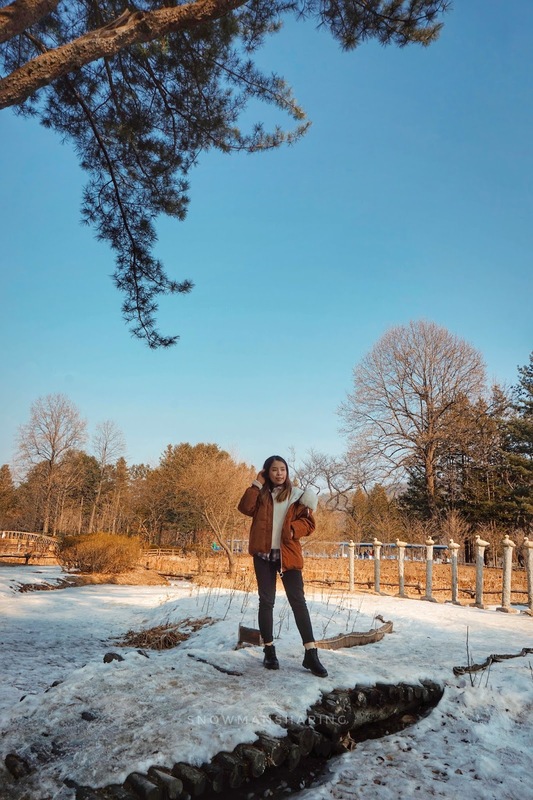 For my day 2, I will be heading Skiing at Vivaldi Ski Park so please stay tuned with my post. Guess there will be not many photos as of today post, because we are having fun skiing and not taking photos, haha! Check out my Instagram Stories here for live videos! 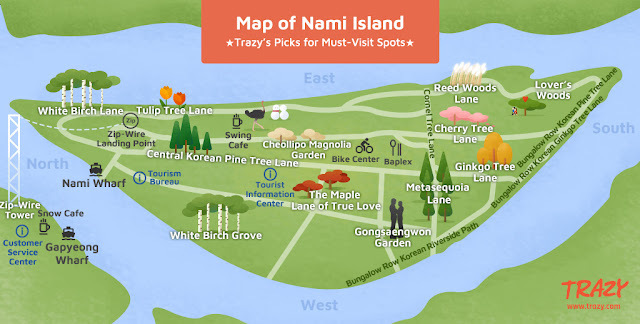 Check out the map of Nami Island.